This is a product review for AVEENO®. I'm a 2014 AVEENO® Ambassador. All opinions are 100% my own. 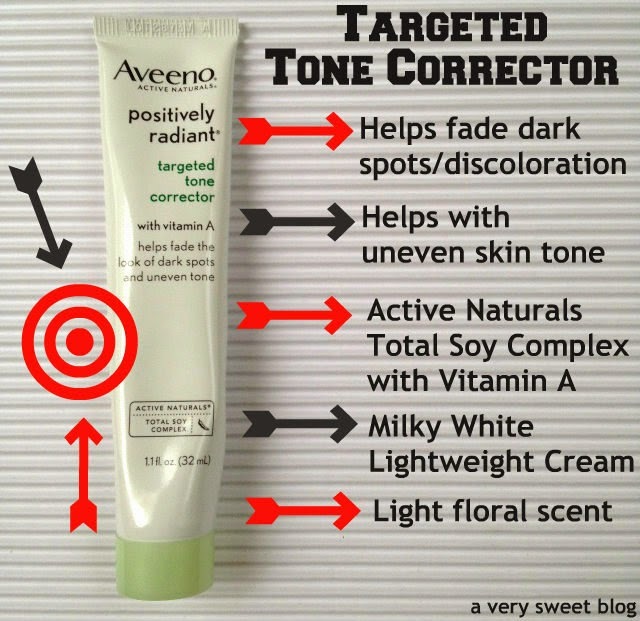 I received a free sample of AVEENO® Positively Radiant® Targeted Tone Corrector to review. Step right up! Gather around! AVEENO® claims their AVEENO® Positively Radiant® Targeted Tone Corrector ($16.59) "helps reduce the look of stubborn dark spots in just 2 weeks"! Only 2 weeks!!! Really??? Yeah, right!!! HaHaHa >.< That's exactly what I said, when I received this product in my welcome basket. To test this, I snapped a picture of some dark spots on my cheeks (March 17th), started using the product twice a day and then took a snapshot of the same area this past weekend. Somebody pick my jaw, teeth and eyeballs off the ground! HaHaHa I couldn't believe what I saw in my picture. 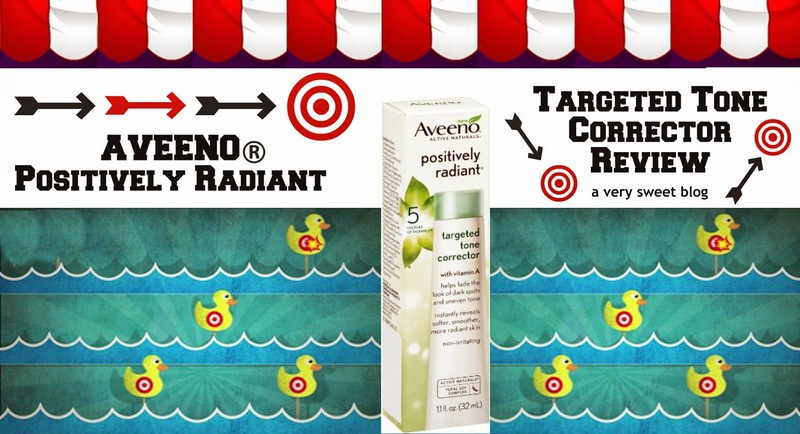 AVEENO hit the bulls-eye with this one and gets a big stuffed toy for this! Oh the joy of reviewing beauty products! I get to show the good, bad & ugly (my skin)! LOL! I really did NOT expect to see results after using this product for only TWO WEEKS. So when I saw my "after" picture, my mouth flew open! I noticed 3 things! 1. The bottom left corner is the corner of my mouth. 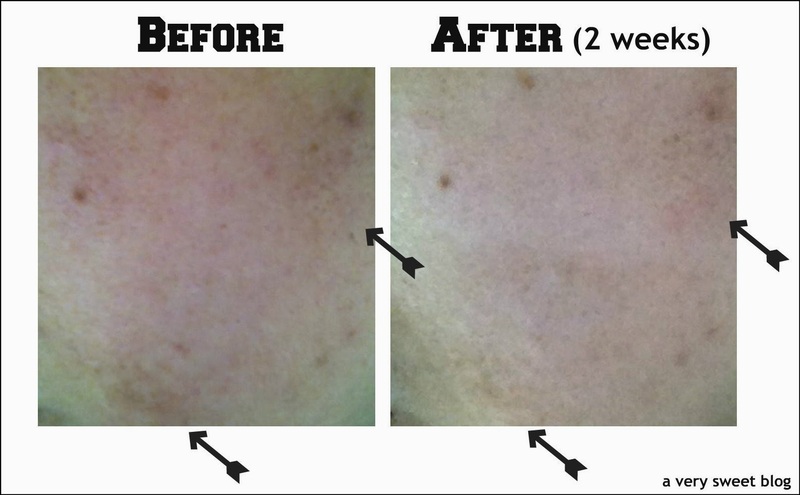 This product has nearly eliminated the dark patch that was near it. 2. Above...to the right....this product has lightened that area. 3. In the middle of my cheek, there's better clarity, less redness and patchiness than before. As you can see, this product DOES NOT get rid of moles (I didn't expect it to, but I wanted to mention it). I don't think it will do much for freckles (but I didn't test for it). Overall, I was thoroughly impressed. I'm really shocked! I've tried various over the counter skin lighteners and never had such results. The only thing that has ever worked, was a prescription from a dermatologist. Have a great week! Great review will look into it. is it just me or do other ppl never expect dark spot correctors to work? but this actually looks like it does!! Hey Kim! I am always sceptical about skin care and the claims that brands make, so I just usually stick to good make up that will cover any flaws. I have never worried about patchy skin, and never understood how people could get dark spots or discolouration, so these products just bedazzled me. A few months ago, I noticed patches. Uh-oh. I was freaked. So now I get it. But I'm still sceptical of the things that skincare products can do. That's why I'm always on the lookout for reviews like this, and I'd like to say thanks for sharing your honest opinion in such depth! Wow very impressive - I will have to check this out! Wow, that is quite impressive! That is so amazing to hear about products that actually deliver results! Thanks so much for sharing this Kim! thanks for sharing your experience Kim, this looks great! OMG you are right! 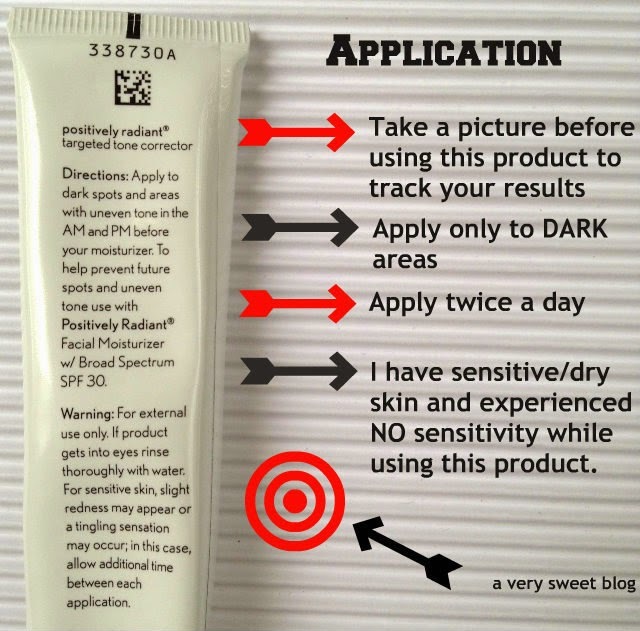 I am on the hunt for a dark spot corrector actually thanks for posting I am going to pick this up for sure!! Than good you have obtained the result you expected, it is difficult to achieve effective products for this type of problem is that this brand is very good, you have good week Kim! Wow, i may have to check this out! Thats pretty good for just 2 weeks. Those are so pretty impressive results after just 2 weeks. Most lightening products take longer. I'd be all over this if it worked on freckles but for the price I just may ave to try it out. Thanks for the honest review Kim! Happy Monday! Enter my Smile Brilliant giveaway! The before after difference is significant. I'd love to give this product a try! Great that you are glad from this product! I have some dark spots too! Although I've never seen this product, I am going to check if I can find it in my country. That is a pretty quick results - 10 days. Nice! Um, WOW! I can't believe the difference after only 2 weeks! I've been using Garnier corrector, but I think I am going to have to switch! I'm a huge fan of Aveeno products and haven't heard of this one before! It really is a great before and after photo!! Wow you can definitely notice a difference. I will be looking for this at Target. i was just looking for products for my dark spots. thanks for this great review! That's an amazing result Kim! I actually can see the difference after the 2 weeks so that's awesome. It's good to know that it works, especially since I'm a big fan of Aveeno products and am always looking to get rid of dark spots. Oh wow, sounds so much interesting, I haven't tried this kind of product before, I tend to see a bit of my dark sport when it summer. it doesn't heart to try. have a great week. That sounds like magic Kim! Hard to believe what a product can do in just two weeks, right? The best part is that it doesn't cost an arm or a leg. I would love to give it a try. My face is so ridiculously red around the cheeks area it drives me nuts. I would love to see your Azaleas Kim. I have heard they are not very easy to care for so I never acquire one but they are just so beautiful. This has to be amazing product, I'm impressed by this before/after effects! Kim, you're hilarious! Lol, I'm sure I would love this product too. I've been using Aveeno Positively Radiant Moisturizer and I love it!! The difference is very good!! This product work well! Thanks for sharing, I love Aveeno too! Ok, this is on my wishlist! This looks great, Kim! It's not often I see products like this that work. Looks like its a good product. Great review!! Wow , the differenze is really big! Wow! I wouldn't never believe that any product actually works like that. Will try it. Thank you. Wow, I really notice the difference, so impressed, I have to try this Kim! Thanks for stopping by dear...I value your opinion. I've heard so many good things about the brand Aveeno! What an awesome review! Looks like it really does work! I seriously need this stuff! The before and after photo really does show it works. I have pink patches of skin on my face and dark spots/ acne scars so this would be perfect! Great review Kim! Wow! This is so impressive! I am kind of shocked by how well + effective this product is! Great review Kim! I see the difference! What a great result and two weeks is no time at all! Isn't it wonderful when you find a product which actually does what it says on the packet? Great review. Wow, it works! Those a great results Kim. Aveeno has really great products. i definitely see a difference!! certainly is worthy of trying! Ooohhh glad to see that it worked! I just love it when you post before and after shots. Helps people see what really happened. Hihi. Wow! I would pick my eyeballs and jaw off the ground too. 2 weeks for this is amazing! I need this product too! Have to go source for it in my country the next time I'm out shopping.